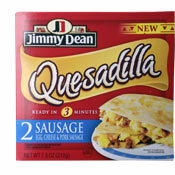 I tried both new varieties of sausage quesadilla from Jimmy Dean. One was made with pork sausage and the other was a turkey sausage variety sold under their "Delights" healthy sub-brand. I found both to be easy to prepare and generally satisfying. Of the two, I liked the flavor of the pork version best. As with any quesadilla, you get bites with a lot of filling and others with just a little. The bites that were loaded with egg, cheese and sausage were great. The sausage tasted authentic and it'd be fair to call this product cheesy. The bites with less filling were decidedly lame. This is to be expected, but it was compounded by the fact that the tortilla is a little more tough and chewy compared to a homemade equivalent. This product felt like it had a little more filling than its pork brother. However, it was clear to my taste buds that it was turkey sausage. It was just as satisfying as its pork compadre, but it tasted "more healthy" and the overall flavor suffered because of it. Granted, if this wasn't a side-by-side comparison, I'd be less likely to complain. The flavor of the turkey sausage is okay - just not as good. Both products ask for a microwave time of 70 to 80 seconds. I actually had better luck at 90 seconds. At the recommended microwave time, there were still occasional cool spots in each quesadilla. For the best experience, let each quesadilla cool to just slightly over room temperature before eating. As the quesadillas cool, the flavors seem to combine resulting in a better, more-uniform flavor. The box tells you to let the product set one minute after microwaving. I recommend letting them set for 3 minutes. 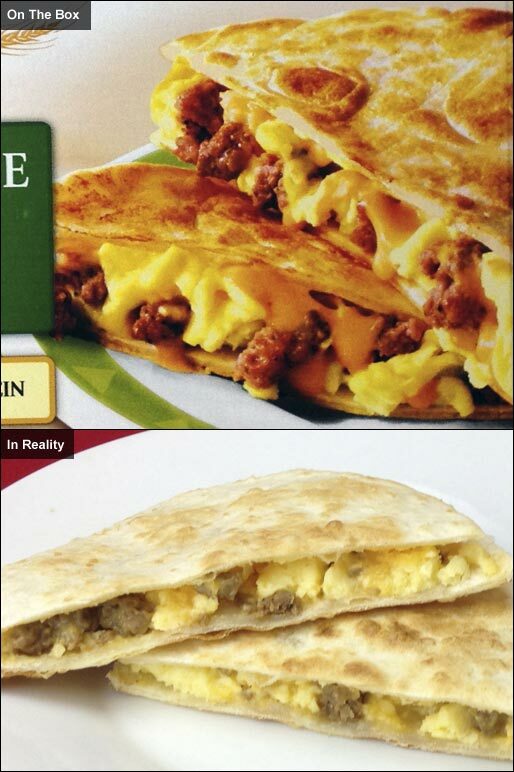 On the whole, I liked both of these quesadillas. They took only 90 seconds to make and they satisfied my morning craving for traditional breakfast foods. Each pork sausage quesadilla has 290 calories, 16 grams total fat (7 grams saturated and 0 grams trans), 145 mg cholesterol, 550 mg sodium, 1 gram dietary fiber, 1 gram sugar and 13 grams protein. Each turkey sausage quesadilla has 250 calories, 10 grams total fat (4.5 grams saturated and 0 grams trans), 20 mg cholesterol, 510 mg sodium, 24 grams total carbs, 1 gram dietary fiber, 2 grams sugar and 15 grams protein. 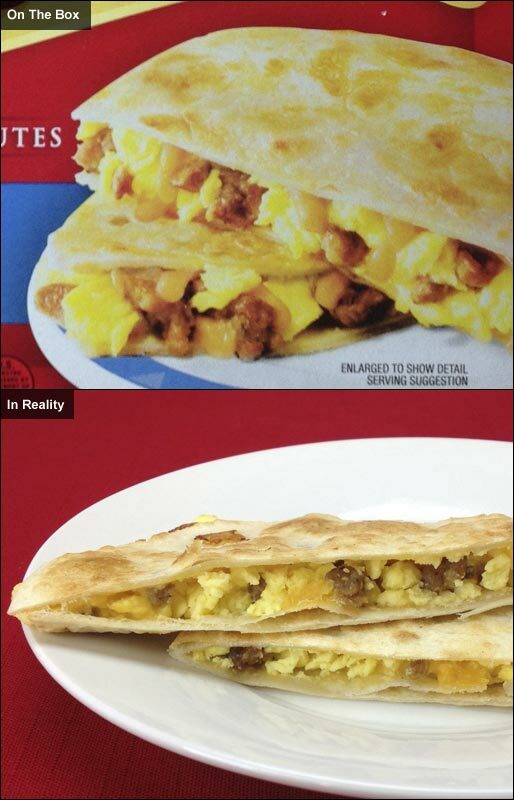 What do you think of Jimmy Dean Breakfast Quesadillas? How big are they? What is the diameter of each quesadilla? I thought they were quite delicious (the pork version). I didn't like them nearly as much as you did. 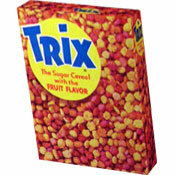 They didn't have much flavor to me.